Even though it was first announced in 2014, Apple's HomeKit is only now starting to establish a solid foothold in the home automation market. The platform should make some real strides towards the end of 2016, not the least because of new kinds of supported accessories and control options. Some of the new accessory types include various forms of "air treatment" equipment —namely humidifiers, purifiers, and conditioners/heaters. Previously HomeKit could only control air through a compatible fan or thermostat. 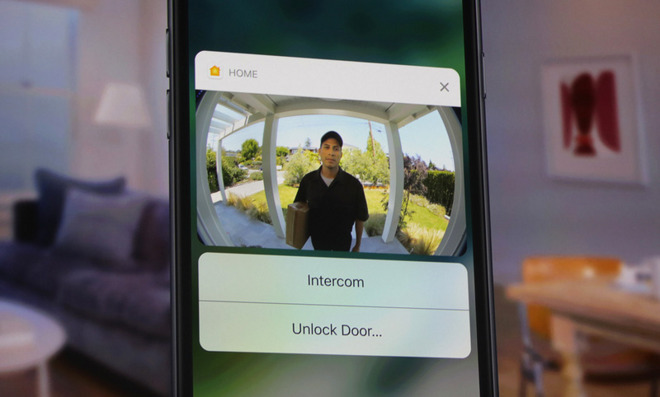 What Apple spent special time on during its WWDC keynote, though, was doorbells and cameras. HomeKit-ready doorbells will support things like volume and "visual indicator" control, and event triggers that can link with other accessories. One might for instance have extra outdoor lights come on when someone visits at night. Something a little more interesting is the ability for doorbells to capture photos or live streams of the people who push them. Apple's Home apps for iOS 10 and watchOS 3 will let people see these feeds from notifications —in the case of iOS 10, even from a device's lockscreen. In some instances these notifications will have associated options like using an intercom or unlocking a door. The new camera support won't be limited to doorbells however, which bodes well for other HomeKit-enabled security systems. Users will be able to adjust camera settings, as well as audio playback and recording. In next major version of tvOS, the fourth-generation Apple TV will gain the ability to control HomeKit accessories through Siri. There will be limits —no control over smartlocks, for example —but users will at least have power over things like lights and thermostats, and multi-accessory "Scenes," as on iPhones and iPads. iOS 10 should make it generally easier to use HomeKit without Siri or third-party apps, thanks not only to the dedicated Home app but a new Control Center pane. Don't expect to take advantage of any of these features soon —iOS 10, watchOS 3, and the new tvOS are still in beta form, and won't be released until later this year. It will also take time for major accessory makers to prepare new products, although some are already in the pipeline, and a few existing devices will be getting upgrades.